Well, it seems sooo long I didn’t hit the theatre. What was the last movie I watched? Could it be Pirates III? When was that? I don’t know why, but my enthusiasm to watching movies at cinema is decreasing. Is it another sign of me becoming older (and wiser too??!). I seem to enjoy life less now. That’s one hell of a good reason to watch good movie any time soon. I’ve always like Hans Isaac. I like him even after the controversial affair between him and …..(who else? Need I mention more?). Me and the rest of the girls and women all over Malaysia cried for him too (chewahh…nampak sangat bohong…tp sedey gak laa)…well, let’s move on and leave this scandal aside. Malas nak promote scandalous affair nih. Let bygones be bygones. When the first time I knew Hans gonna produce and direct a movie, it gets me excited. 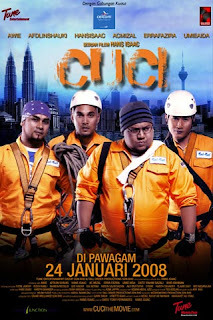 When I heard the title “Cuci”, I became less fascinated. Of all the title in the world, I never expect him to pick that one out. I had no idea what the plot gonna be. But Hans is one smart guy. His first movie is a comedy. With him and his best friends, the 3As (Afdlin, Awie and AC), surely it will be a repeat to a well-received “Baik Punya Cilok”. I laugh so hard while watching that movie. I’m sure “Cuci” will do the same, if not more. I didn’t expect so much from it. It’s a movie to make you laugh and smile. After so long, it will be just the right movie to make me step into that “dark room”. owhhh...kuar mgu nih la kan? berry nice...aku takkan miss lepas nih!! her, dh tgk ke? aku pun mcm teringin gak nk tgk cuci ni, awat tah.. hehe tapi anak sapa nk babysit la pulak kan weekend2 ni? hehe nk dating2 gitu dgn mr.copa..